This Nieuw Amsterdam, the second of three Holland America ships with that name, is considered by many experts to be Holland America's finest ship, worthy of being included in the "Ships of State" category with Queen Mary, Normandie, Bremen, Europa and Rex. 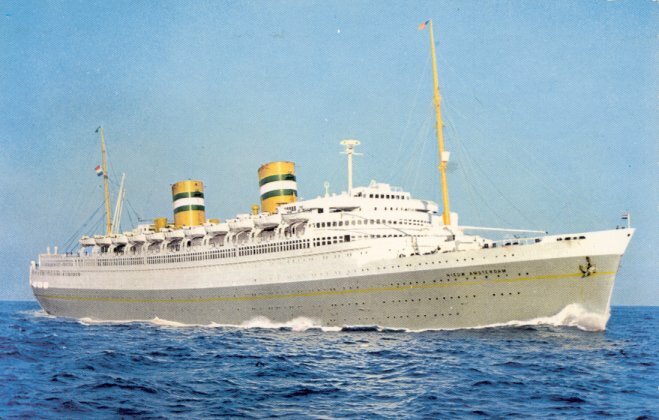 Built by Rotterdamsche Droogdok Mij, she was launched in April 1937 by Queen Wilhelmina of the Netherlands, and made her maiden voyage from Rotterdam to New York, with calls at Boulogne and Southampton, on 10 May 1938. 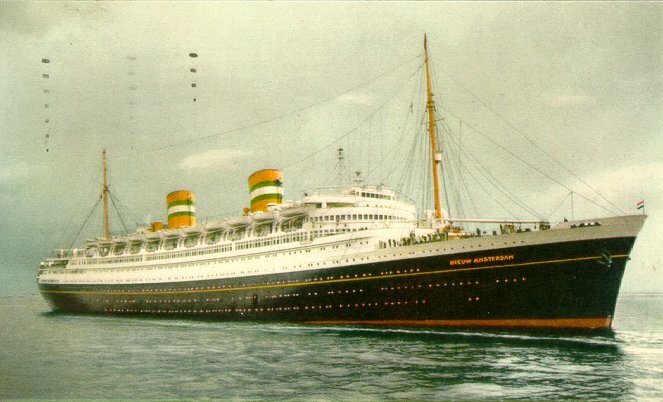 On 22 September 1939 Nieuw Amsterdam made her final Rotterdam-New York trip after World War II began. The Netherlands was a neutral country at that time and had not yet been invaded by Germany. From New York she engaged in Caribbean cruising and was laid up in Hoboken, New Jersey, for a time. At sea when the Netherlands was invaded in May 1940, she returned to Hoboken and was handed over to the Allies by the Dutch government in exile. Converted at Halifax into a troop carrier with a capacity of 8,000, she was placed under Cunard White Star management and dispatched to Singapore, where she was armed with 36 guns. 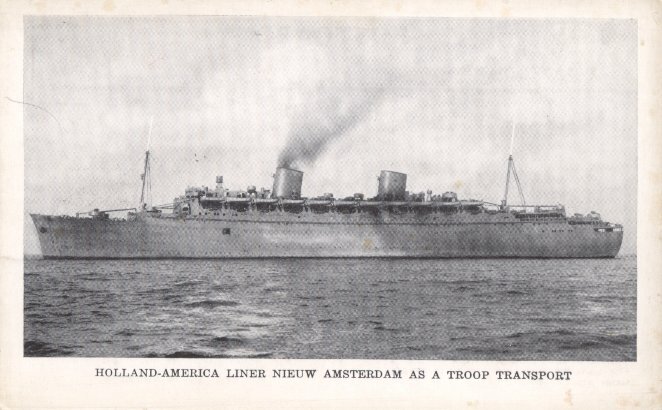 Fast enough to outrun German submarines, Nieuw Amsterdam was allowed to travel out of convoy, and was used to carry British troops to North Africa and United States troops to the Pacific theatre and England. All told, during the war she traveled more than 530,000 miles and carried over 378,000 persons, including prisoners of war transported from North Africa to the United States. Nieuw Amsterdam returned to her Rotterdam-New York route in October 1947, after a refit by her builder that cost more than her original construction. Her refit included a conversion into first/cabin/tourist configuration capable of accommodating 750 passengers in a single class for cruising. Her passenger accommodations were again modernized in 1961, and when she returned to service she spent six months a year cruising. In 1971 she was devoted fill time to cruising, mainly from New York, making only occasional positioning trips across the Atlantic, including HAL's final transatlantic crossing on 8 November 1971. 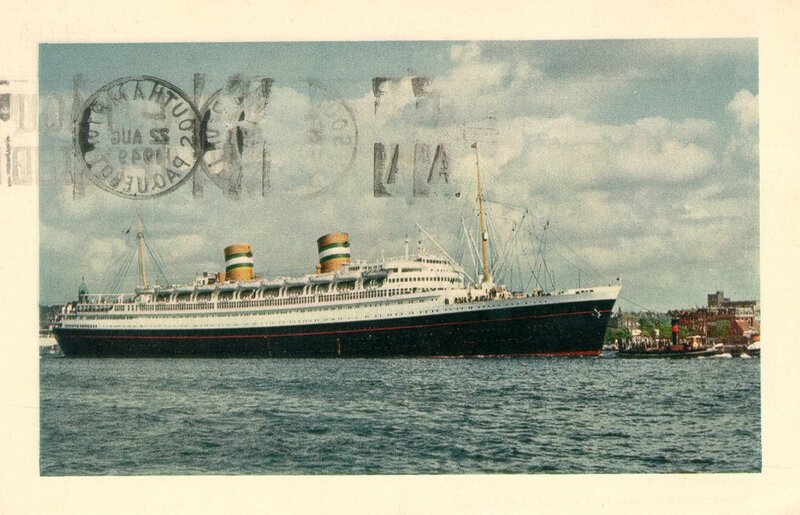 In 1973, the ship was registered to N.V. Nieuw Amsterdam, and was used for cruising out of Port Everglades, Florida. Her final passenger-carrying trip was a January 1974 cruise to Curacao and Los Angeles. From there she left for Taiwan and the shipbreakers at Koahsiung. She arrived there on 2 March 1974. Sources: Bonsor's North Atlantic Seaway; Kludas' Great Passenger Ships of the World; Haws' Merchant Fleets; Kohler's The Holland America Line.